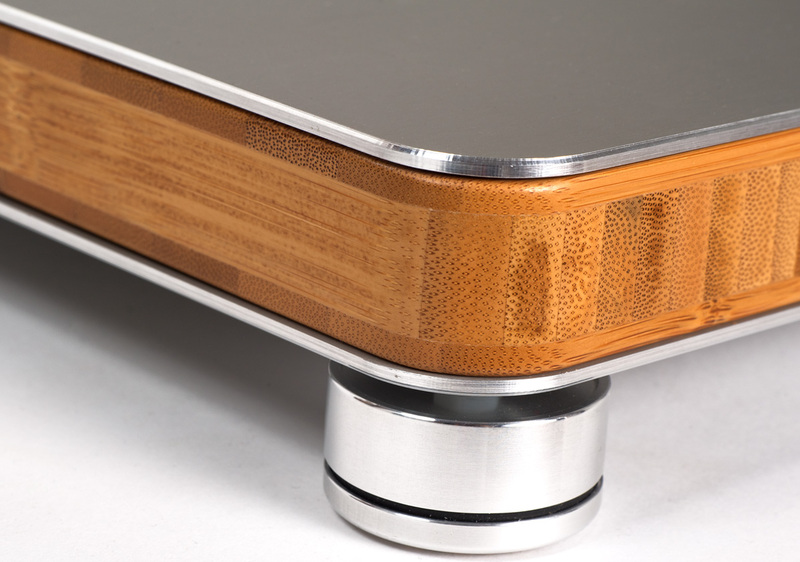 This review first appeared in the February 2016 issue of high-end hifi magazine fairaudio.de of Germany. You can also read this bFly Audio review in its original German version. We publish its English translation in a mutual syndication arrangement with the publishers. As is customary for our own reviews, the writer's signature at review's end shows an e-mail address should you have questions or wish to send feedback. All images contained in this review are the property of fairaudio or bFly Audio - Ed. Without a solid foundation, partner potential is limited. Now even the most promising relationships are doomed to fail. That's something most of us should have experience with already (or will in the future). It's particularly sad when the elements of said liaison—people or hifi components—are blessed with excellent qualities. Similar to cables which can skew the sound in bad ways, mechanical behaviour is bedeviled by very real potential to do bad. Any form of motion in parts which conduct current creates unwanted signal. Think electromagnetic induction and microphony. Even the most minuscule of vibrations, be they induced externally (foot fall and air pressure) or inside a machine (transformer, transport), can have sonically detrimental effects. The logical aim is to keep signal-path parts far removed from resonance contamination. Aside from how the machine itself is constructed, the next most important contributor is its support. Think floor, furniture, shelf, TV stand, hifi rack. The importance of such bases is often underestimated, perhaps more so than the even more fundamental subject of room acoustics. In my Norma Audio Revo SC-2/PA160MR review, I sidestepped this topic for reasons of length but the SC-2 preamp proved quite sensitive to what it sat on. This became painfully obvious during a recent swap triggered by the need for more space, storage and no visible cable salad. A sonically quite benign Ikea TV console moved out, a modular 9mm MDF shelving system from Berlin supplier Stocubo moved in to become my new hifi throne. This caused a noticeable spatial compaction in the depth domain, compromised resolution and definition and even flattened out microdynamic nuance. Schweinehund! I needed Audioplan's Antispike component footers to redress the losses. A triplet beneath each machine recovered grip and brilliance. Happy days. Really? Some 'really' is better than other 'really'. That's what today's bFly Audio component bases told me. Colleague Ralph Werner handed me three grown-up cartons which suggested quality components not accessories inside. Drat. My hope to not again drag heavy stuff up into our 4th-floor flat across so many stairs faded to nothing. No elevator either, thanks for asking. Yeah, these bases were no lightweights especially packed. 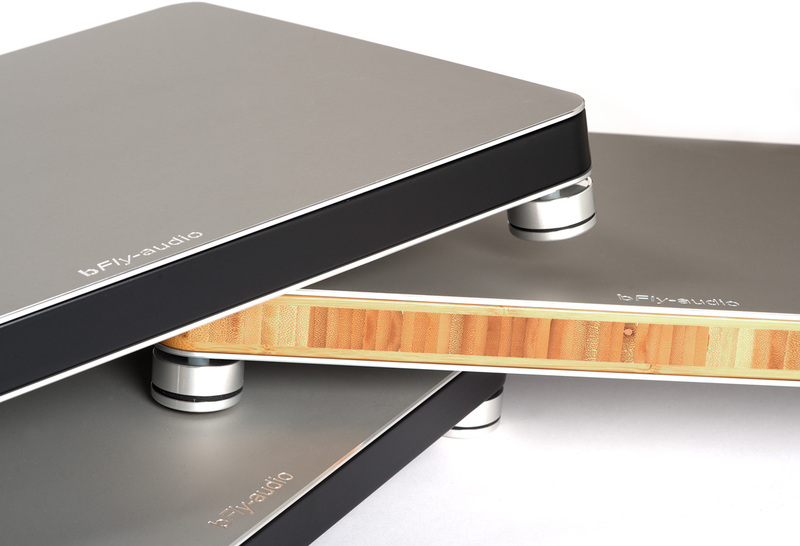 The two bFly PowerBase models in size L weigh in at 7.6kg per, the comparator BaseTwo at 6kg isn't much less. Like the BaseOne entry model, both types come in four sizes - from S (25x30x5.6cm) to XL (56x46x5.6cm). Today's fiscal spread sits between €379 for a BaseTwo S and €1'099 for a PowerBase XL. My PowerBase L tester at 50x40x5.6cm comes in at €949. All versions arrive with four height-adjustable footers screwed into threaded PVC receivers without give or shake and are Basic or Pro types depending on platform model. Also selectable is the wooden core's colour: natural or black lacquer. The BaseTwo uses 30mm Birch Ply. 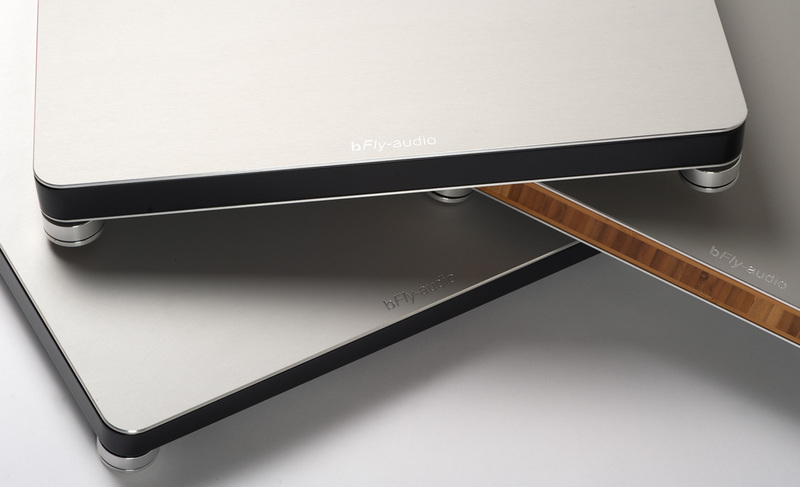 Today's focus on bFly's latest PowerBase gets us 30mm bamboo laminated from three layers each counter-rotated by 90° to exhibit "excellent audiophile behaviour". This epitomizes BFly's multi-layer adjustment or MLA concept which elsewhere goes by constrained layer construction. In a nutshell, boss Reinhold Schäffer believes that combining dissimilar layers in a specific sequence (!) ends up with the best broadband resonance attenuation.